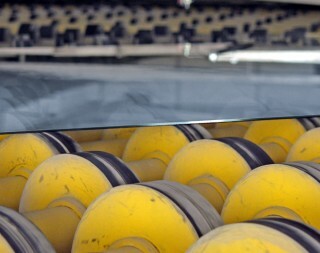 The mainline production of the plant is flat glass “Interglass – Float”. Thermally polished glass is obtained through the method known as float-process, invented by Alaster Pilkington in 1952. The process involves the following stages: molten batch at the temperature of approximately 1000 °С flows on the molten tin in the special bath with protective atmosphere of nitrogen and hydrogen. 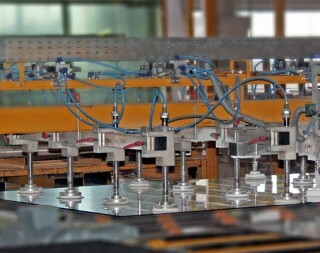 The edging machines provided with rollers, located along the sides of the molten bath, pull off the glass ribbon, thus determining its final thickness. At the bath exit, at temperature of 650-680 °C, the formed glass ribbon comes into the lehr kiln where it is then specifically cooled. At the temperature of approximately 80 °C the glass comes to the cutting line to be cut in accordance with specified sizes. The thickness of the glass ribbon can be altered by varying the speed inside the kiln and position of edging machines. Packing — non-returnable (wooden box).